Adonis “Superman” Stevenson (21-1, 18 KOs) made a huge statement when he scored an explosive first round knockout against “Bad” Chad Dawson (33-3, 17 KOs) to become the new light heavyweight king. This dazzling display of sheer strength and power catapults Stevenson into the spotlight of an already interesting 168-175 pound landscape, which includes Andre Ward, Carl Froch, and living legend Bernard Hopkins to name a few. Stevenson suddenly finds himself in a unique position where a slew of lucrative opportunities are likely to surface. I was recently afforded the opportunity to speak to Stevenson about his championship winning performance, his future in boxing, and his opinions of some of the other big names who reside in and around his weight class. Here is what the new champ had to say. GEOFFREY CIANI: Hello boxing fans. This is Geoff Ciani from East Side Boxing, and I am joined here today by the newly crowned light heavyweight champion of the world, Adonis Stevenson. Adonis, first of all, congratulations on your outstanding victory. ADONIS STEVENSON: Thank you very much. CIANI: Now tell us, that knockout against Chad Dawson you scored, take us through that first round of action before the knockout blow. What was going through your head and what did you see in the ring? STEVENSON: I know Chad Dawson is a southpaw. First of all he’s an orthodox, and he switched to southpaw. So I knew that his power hand is in the right hand. I knew he had power in the right hand, and I just executed my game plan. I was training for this fight, and my speed. This left hand I practiced in the training. This left hand I practiced a lot, so I cashed in on this left hand, but in the gym I was practicing this left hand. CIANI: Now when you knocked him down, did you have any doubt in your mind that the fight was going to be over then? STEVENSON: Yeah, because I practiced this punch in sparring, and I knew this punch is an amazing punch. And I knew when he was going down, I thought it was over, but I said, ‘You never know’. You never know. So I wanted to make sure I would be ready to finish the job, so then after when the referee stopped the fight, he did a good job because Chad Dawson—he got up, but he was not fine to continue the fight. CIANI: Did you ever imagine going into this fight that it would end so quickly? STEVENSON: That’s the best punch, and in boxing you never know. You can have experience, you can defend your title ten/twenty times, with a lot of experience and a lot of technique, but you know this is boxing, and you could get caught with a good punch and it’s over. CIANI: Now a lot of your critics are trying to downplay your victory a little bit, and some people are saying that Chad Dawson was damaged goods after his fight with Andre Ward. What would you say to the people that are making those types of criticisms? STEVENSON: No! People don’t give me my credit, because you know I weigh 168. My weight class is 168, and I go up to 175, and Chad Dawson said he was prepared for this fight and this was the best training camp in his life. That’s what he said. You know, people have to give me my credit, because I was 168, and I gained weight, I go to 175, and I do my job. Chad Dawson came in the ring very prepared for this fight, and he had a great training camp, and Eddie Mustafa trained him very well, too. You know. So people have to give the credit. CIANI: You mentioned something there a minute ago, Ad and onis—168. With this victory you suddenly have a lot of options out there both at 168 and 175. If you could choose any path to your liking, who would you ultimately like to fight next? STEVENSON: I can make 168 easily, but I would like to fight and unify the titles—you got Bernard Hopkins, he’s a champion of the IBF. And you got Andre Ward. You got Carl Froch, I would like to fight him. And you have Mikkel Kessler, that’s an option right there I can fight. But I’m going to sit with my promoter and talk about that and what’s next. CIANI: Okay. I just want to get your opinion here on some of these guys you mentioned, and let’s start with Bernard Hopkins. His last fight was against Tavoris Cloud. What did you think of Hopkins’ performance in that fight? STEVENSON: Oh! It was a good performance, a great performance. You know Bernard Hopkins is a great boxer, he’s a legend, he’s a Hall of Famer, and in this fight he fought Tavoris Cloud very good. It was a very good fight, smart, smart fighter. I know Bernard Hopkins is a good, good fighter, and a smart fighter. You know and he did a good job with Tavoris Cloud. It was a good fight. It was a very smart fight. CIANI: What do you think of Hopkins’ upcoming fight in July against Karo Murat? STEVENSON: I think Hopkins is too smart. He’s too smart and too slick. And I know Karo Murat. I sparred with Abraham two years ago, and I saw him fight. I saw him sparring, I think. Bernard is too much for him, and Bernard’s going to win this fight. CIANI: Now Carl Froch was another guy you mentioned. He of course, just a couple of weeks ago, beat Mikkel Kessler in their rematch. What did you think of that fight, and were you surprised that Froch was able to win this time? STEVENSON: No, I was not surprised Carl Froch won this fight. I’m not surprised. I know the fight the one time with Kessler, and the fight was close, and this fight the second time was in the UK. I’m not surprised he won the fight. This was a great fight, but I knew Carl Froch was going to win this fight. He beat Lucian Bute and he looked great that night, so the guy was right at the top. So that’s why I knew he would win this fight. CIANI: The other guy you mentioned, of course, the winner of the Super Six tournament, Andre Ward. In his last fight he actually fought Chad Dawson. What do you think of him overall and where he fits in between 168 and 175? STEVENSON: If I fight Andre Ward at 168, I can go fight in his home town. Then we can have a rematch at 175 and he can come to my home town to fight. That’s what I’m proposing. His fight with Chad Dawson, it was a good fight. You know? It was a good fight and he beat Chad Dawson, and that’s a good way to do it. CIANI: What do you think the key is to beating somebody like Andre Ward? STEVENSON: I have to keep it to myself. I can tell. I know how to beat Andre Ward. CIANI: With the quick knockout against Chad Dawson, I have to ask you, Adonis: are you at all worried that maybe on some level, with all of the knockouts you’ve been scoring and that explosive knockout, that you might become too reliant on your power and neglect some other areas of your game? STEVENSON: I’m not worried, you know, because I train. I train hard, and I got my trainer, the nephew of Emanuel Steward, Sugar Hill. He gave me a lot of good training and good advice. He’s very smart and he got a lot of experience because he’d been around Emanuel Steward, so I’m not worried. CIANI: It’s interesting you brought that up. How has that been? The transition for you, where you had to go through some difficult times when Emanuel sadly passed away during your working relationship with him, and now you’ve stuck with Sugar Hill—has that been a smooth transition for you? STEVENSON: Emanuel, he was training me, but with Emanuel he had all the HBO shows or he had Wladimir Klitschko. He trained with Wladimir Klitschko, but then Sugar Hill trained me. So now Sugar Hill is just training me now. So he knows me very well. CIANI: Now you’re 35 years old. What can the fans expect from Adonis Stevenson going forward? STEVENSON: You know I’m 35, but you know I started late at 29. So my body, I don’t have a lot of rounds. My body is still young. I can fight a couple of years again. So now next, I want to fight the best fighters—the best fighters in the division at 168 and 175. CIANI: Do you think your best days are still ahead? STEVENSON: Oh yeah! Of course, because I started my career at 29, you know? With a lot of people they start younger, but that’s the age, 35/30 years old, and it’s over. You know, because they take a lot of punches and have a lot of rounds. But with me it’s not the same thing. I don’t have a lot of rounds, and look at Bernard Hopkins. He’s 48 years old, and he’s a champion of the IBF. So I am 35, so? I can fight. CIANI: Great! 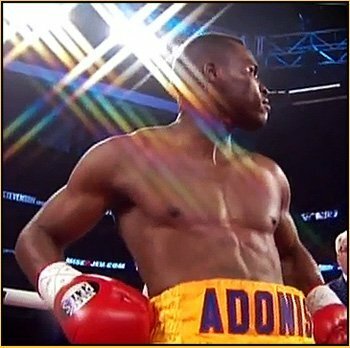 Adonis, for my final question, is there anything else you would like to say to all the boxing fans and the readers of East Side Boxing? STEVENSON: I want to thank all the fans, and I want to thank East Side Boxing Follow me at @AdonisSuperman on Twitter. And thanks everybody! Don’t miss my fights, and I think I’m going to fight in September. CIANI: Adonis, it was an absolute pleasure once again getting the chance to speak with you hear today. I want to thank you for your time and wish you the very best of luck going forward. I can’t wait to see you back in the ring, and you helped make 168 and 175 more interesting again. STEVENSON: Thank you very much.